Congratulations! You've made it through the first half of the 30-day challenge. The next two challenges relate to outward practices that help us go deeper in meditation. 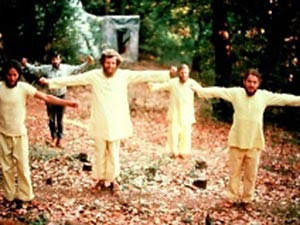 Group practice of the Energization Exercises during a pilgrimage to India in 2012. In 1920, Paramhansa Yogananda created the Energization Exercises, a series of 39 exercises that help us to be more aware of and learn to control the energy in our bodies. If you already know these exercises, today's challenge is toread this article, A Dance of Devotion, and choose at least one of its suggestions to bring into your practice. If the energization exercises are new to you, today's challenge is to learn the sample practices in this article and do them before each meditation. Don't Know the Exercises, but Want to Learn Them? The Energization Exercises are Yogananda's unique contribution to yoga, a cornerstone of the path of Kriya Yoga that he presented, and improve the effectiveness of other meditation techniques. The best way to learn them is in person, but the Lessons in Meditation online course and the iPhone and iPad app are excellent substitutes when learning them in person is not an option. Here are a few points that help to keep me practicing the exercises and having fun in the process. If you already know the Energization Exercises, this is your ticket to greater results. And if you’re new to them, you’ll get all the instruction you need to make this powerful practice a part of your daily life.